Bring new life to any patio, balcony, courtyard, rooftop or other hard surface. Our Ipe wood tiles are designed to bring years of enjoyment and maximum service life in the most demanding, fully exposed exterior environments. Due to the special interlocking plastic base, you can quickly and easily lay these tiles over your existing patio in just a short afternoon. Just snap the tiles together, perfectly aligned and with precise spacing. Even if you’re not really a do-it-yourself type, you’ll be amazed how easy these tiles are to install. And you don’t need any special tools except perhaps if you have to cut a tile to fill in the remaining gap against a wall. In that case, you can simply cut the tiles with a normal handsaw. Otherwise all you really need is a tape measure and a pair of sturdy gloves. Everything you need is right inside each box of tiles. We do however recommend that you coat the tiles with a good quality decking oil as soon as practical after installation as that will slow down the rate at which these tiles will naturally fade to a silvery grey color. To keep the tiles in their best condition it is recommended that you recoat with a decking oil at regular intervals, depending on the climatic conditions and the degree of exposure to direct sunlight. 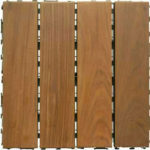 Our SwiftDeck range of wood decking tiles is constructed exclusively with Ipe wood. We use this wood species because it is one of the most durable, hard and dense wood species commercially available with a life of more than 20 years in exterior exposed conditions. Unlike many soft woods, it is exceptionally resistant to scratching and scuffing, much more resistant to mold and mildew, and tends not to splinter as it ages but simply weathers gracefully to a soft silvery grey color, keeping its smooth surface for many years in the future. 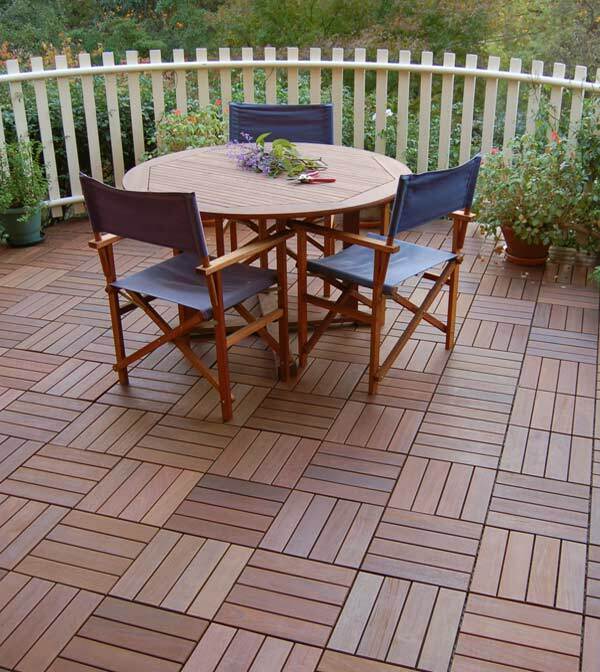 Please note that we offer two different types of wood decking tiles , which are designed for different applications. Our SwiftDeck interlocking tiles are designed as a do-it-yourself type of product which can be laid directly over an existing hard surface like concrete. 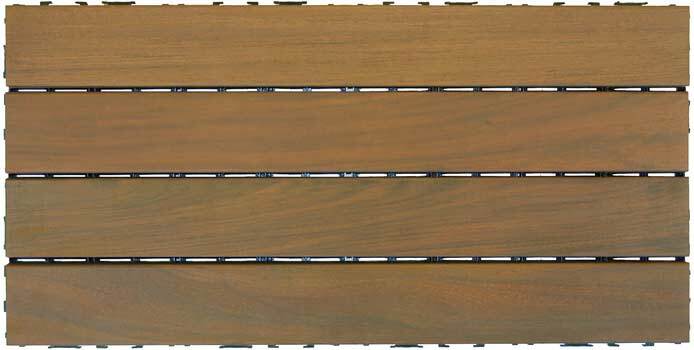 The wood slats on these tiles are attached to a plastic base with corrosion resistant screws, but the plastic base is somewhat flexible in one direction, so these tiles should not be laid directly over wood bearers or used with adjustable height pedestals. 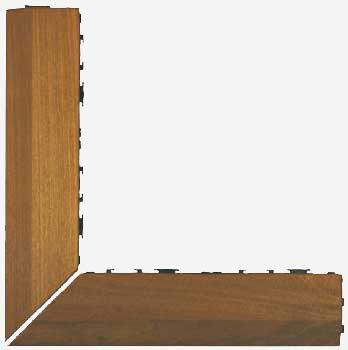 The other type of wood tile we offer is 24″ x 24″ Ipe wood tiles which have solid wood bearers. These decking tiles are a structural grade tile which use thicker wood and did not have a plastic base, nor are they interlocking. 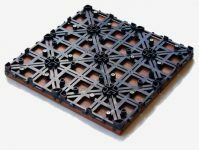 These tiles are specifically designed for laying on adjustable height pedestals for constructing decks on rooftops, terraces or other such elevated applications. For a neat finish at the edge of the outer row of your deck area, we supply optional transition pieces. These pieces are simply clipped to the outer row of tiles to provide a sloping transition from the deck surface to ground level. Note that a small gap is left under the lip to allow water to drain under these transition pieces. The straight transition pieces are available in either in 12″ length or 24″ length. The corner transition pieces are supplied as a pair of left-hand and right-hand pieces – one pair for each outside corner of your deck. 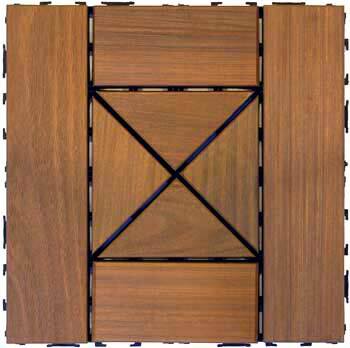 Unlike some other interlocking deck tiles, the Archatrak interlocking base is completely symmetrical. The advantage of this is not only that it is much easier to lay, but also if you need to take a tile up for inspection, you can simply lift up any single tile, whereas with the alternative method used by other tile manufacturers, you have to disturb all the tiles around the tile that you wish to take up.